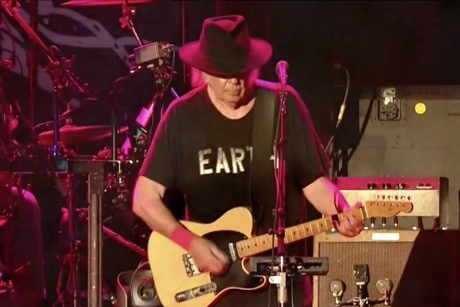 The orchestral version of Neil Young's "Who's Gonna Stand Up?" has already gotten its own video, but now the songwriter has shared a set of visuals for the rock version of the same track. This live version of the tune is whole lot louder and angrier than the orchestral or acoustic versions heard on Young's new album Storytone. This adds a sense of impassioned urgency to the visuals, which convey the song's environmental message with images of pollution, protesters and big oil.